on Monday, January 16th, 2017 at 11:24 a.m.
By Miriam Valverde on Thursday, August 9th, 2018 at 10:03 a.m.
President Donald Trump is back at his New Jersey golf club on another "working vacation." Trump's 11-day stay at his Bedminster, N.J., club kicked off Aug. 2. Since then, he's taken a day-trip to Ohio for a campaign rally for congressional candidate Troy Balderson; has spent time on the golf course; had phone calls with lawmakers and administration officials; dinner with supporters; and scheduled a dinner with business leaders Aug. 7. The White House said the point of that meeting was "to hear how the economy is doing from their perspective and what their priorities and thoughts are for the year ahead." Trump last August spent more than two weeks at his Bedminster club, but pushed back against labels of his trip as a "vacation." "Working in Bedminster, N.J., as long planned construction is being done at the White House. This is not a vacation - meetings and calls!" Trump tweeted Aug. 5, 2017. Trump last August also said his trip to Bedminster coincided with long-planned White House renovations (True). This time around, White House spokesman Hogan Gidley on Aug. 6 said Trump was at Bedminster as the White House "undergoes needed renovations to the Oval Office and other areas in the West Wing." But in a more detailed White House statement Aug. 7, there was no mention of the Oval Office's renovations, Roll Call reported. Before assuming office, Trump repeatedly criticized former president Barack Obama for the amount of time Obama spent golfing. Yet, PolitiFact's Trump Golf Tracker (last updated May 18) shows that in his first year as president, Trump outpaced Obama in the amount of time spent on golf courses. 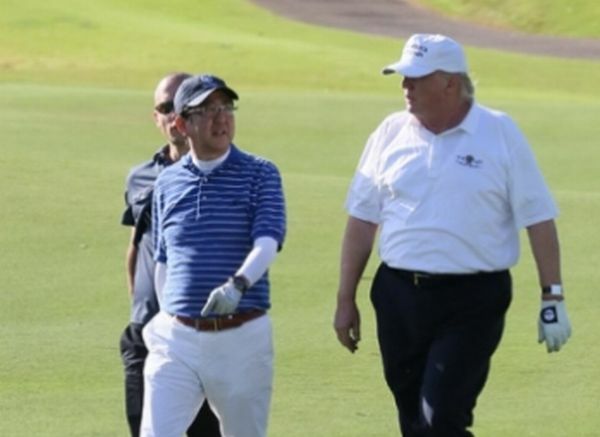 The White House on several occasions has declined to confirm Trump's golf outings, but Trump's press secretary Sarah Sanders has also said that spending time on the golf course with lawmakers has helped Trump develop "deeper and better relationships" with them. Trump still has several "working vacation" days left this August, which could include down time and presidency-related events. For now we'll continue to rate his promise not to take vacations as Stalled. Is a 'working vacation' still a vacation? By John Kruzel on Friday, August 4th, 2017 at 3:26 p.m.
President Donald Trump is leaving Washington for a 17-day trip to his golf course in Bedminster, N.J., on what the White House is calling a "working vacation." This seemingly paradoxical term raises a thorny question for promise-tracking purposes: Is a "working vacation" a "vacation"? Aides to President George W. Bush described his trips to his ranch in Crawford, Texas, as "working vacations" and the phrase was applied to at least one Florida jaunt by President Barack Obama. Even presidential retreats that are not specifically billed as working vacations seem destined to entail some work due to the demands of the office. When Obama traveled to his native Hawaii in December 2013, aides said he hoped for "a period of uninterrupted rest and relaxation." In other words, a non-working vacation, or what Merriam Webster defines as "a period spent away from home or business in travel or recreation." Yet ahead of Obama's non-working vacation, aides said he would continue to receive daily national security briefings as well as updates on the troubled Obamacare implementation, and would also carve out time to consider reforms to the NSA's surveillance program. Presidential vacations are also highly vulnerable to being swallowed by the the unforeseen. Some wondered if Obama's vacations weren't "cursed" given a pattern of interruption by international strife, terrorism or political brinksmanship back in Washington. So it's safe to say the line between a vacation and working vacation is blurry and that all presidential retreats entail some work. But another truism is that a president's critics can be counted on to exploit the inherently bad optics of a president at leisure. "Whenever a president goes on vacation, the opposition always raises a fuss about it," Kenneth Walsh, author of the book From Mount Vernon to Crawford: A History of the Presidents and Their Retreats, told USA Today. "It's sort of an easy target." Sure enough, then-non-politician Trump, who called Obama's work ethic into question and regularly criticized him for spending too much time on the golf course, bemoaned Obama's December 2013 trip as "a 17-day vacation." Likewise, Trump is now getting his fair share of critical coverage -- especially in light of his berating Obama. "This is what's commonly known as being super, super hypocritical," wrote CNN's Chris Cilizza. "Not an uncommon look for politicians, but still worth calling out." In Trump's defense, his upcoming trip may be driven in part by necessity. White House spokeswoman Lindsay Walters said the West Wing staff needs to vacate the premises so that workers can replace the building's aging heating and cooling system. It remains to be seen how much leisure time Trump will get relative to time spent working on this upcoming working vacation. We'll continue to monitor this and other presidential trips before weighing in more definitively. Trump's extended trip to his golf resort looks more like a vacation than not. For now we rate this promise Stalled. By Gabrielle Healy on Thursday, April 6th, 2017 at 3:42 p.m. Since taking the oath of office on Jan. 20, President Donald Trump has visited his Palm Beach resort Mar-a-Lago six times. With his trips attracting significant media coverage, many readers have asked us to rate the president on his campaign promise to "not be a president who took vacations." Rating this promise is tricky, because it hinges on the definition of a "vacation." Is the president taking time off while he's in Palm Beach? Or is he doing the same work there that he does in Washington? The line between vacation and work in this case is more fuzzy than clear. Presidential aides have been cagey about Trump's schedule while spending time at Mar-a-Lago and other properties he owns. For instance, his communications office has sent some mixed messages about how much time Trump is spending on his golf game. We reached out to the White House for clarification but didn't hear back. So we looked at some of the activities we do know about. • Trump attended the Red Cross Ball, a fundraiser which was held at the resort on Feb. 4. • He hosted Shinzo Abe, the Japanese prime minister and his wife, Akie Abe, during a weekend in mid February. On Feb. 11 during Abe's visit, officials told Trump during dinner that North Korea tested a ballistic missile. Trump worked out his response in view of the other diners, a highly unusual move. • He played a full round of golf with pro Rory McIlroy and Clear Sports CEO Garry Singer on Feb. 19. The president also announced the appointment of Army Lt. Gen. H.R. McMaster as his national security adviser in a brief appearance with reporters during that weekend. • He visited a Catholic school near Orlando to discuss education reform before going to a Republican fundraising dinner on March 3. • He was scheduled to host Chinese President Xi Jinping at Mar-a-Lago for a U.S.-China summit starting on April 6. Administration officials such as Attorney General Jeff Sessions and Commerce Secretary Wilbur Ross have also been spotted at Mar-a-Lago. Trump also has been playing golf at his properties close to home. He played with Sen. Rand Paul, R-Ky., and Office of Management and Budget Director Mick Mulvaney on April 2 at Trump National Golf Course in Potomac Falls, Va., according to CNN. That outing represented his 14th trip to one of his courses since taking office. What these bits of information about Trump's activities suggest is that he has been combining work with play. That's hardly unprecedented for a president -- his predecessor, Barack Obama, played a lot of golf with administration officials and others during his tenure. The main difference is that Trump has spent more time at Mar-a-Lago, located far from Washington. Trump hasn't taken a clear "vacation" yet. But given the short time he's been in office, combined with the lack of a major travel holiday since his inauguration, he wouldn't necessarily have been expected to. With lots of big holidays coming up in the next few months, including Memorial Day, Independence Day, Labor Day, Trump will have opportunities to make his intentions on this promise clearer. So we're taking a wait-and-see attitude. For now, we're keeping this rating at Not Yet Rated. Huffington Post, How Much Does Trump Actually Work At Mar-A-Lago? Maybe Not So Much, April 2, 2017. By Allison Graves on Monday, January 16th, 2017 at 2:19 p.m. Starting Jan. 20, 2017, we'll be looking closely at Donald Trump's calendar to see if he takes any vacations. In 2015, Trump told The Hill he would not be the type of president to take time off for vacation. Flash forward one year and Trump has watered down that promise, saying he won't be big on vacations. "There's just so much to be done," Trump told CBS' 60 Minutes in an interview broadcast Nov. 13, 2016. "So I don't think we'll be very big on vacations, no." Barack Obama made a similar claim before being elected president in 2008: "You give me this office and in turn, my fears, doubts, insecurities, foibles, need for sleep, family life, vacations, leisure is gone," Obama said in 2008. "I am giving myself to you." But by September 2016, Obama had gone on 28 vacations (including long weekends) spanning all or part of 217 days. This was with four months left in his presidency. In the past, PolitiFact has turned to CBS White House reporter Mark Knoller's unofficial but widely trusted data on presidential vacations. Knoller told PolitiFact in January he would be tracking Trump's travels. Knoller has kept track of other presidents' travels, including Bill Clinton, George W. Bush and Obama. He once noted that a president is really never on vacation because the responsibilities of the job follow him.